Berries have been on sale lately so I’ve been making danishes and strudels all week. 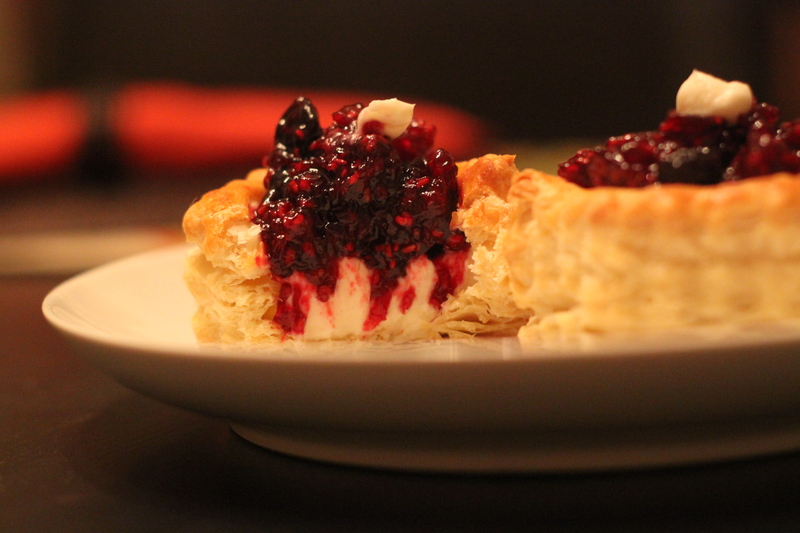 The berry compote that goes inside a danish is so delicious that I wanted to try it with a sweetened cream cheese. These cups can be served with coffee for breakfast or with an espresso for dessert. Either way, this gorgeous treat takes no time at all! Preheat your oven to 475. Beat your egg and water to make an egg wash and brush it on top of your frozen pastry cups. Place all 6 on parchment paper and bake for 15 minutes. While your pastry cups bake, combine all of your berries into a bowl and smash. Add 1 cup of sugar and stir thoroughly. Place the bowl in the microwave for 18 minutes stirring 3-4 times. Melt the white chocolate and cream in a small saucepan on low heat and set aside. Your pastry cups should be done. Take them out and remove the tops with a fork. Also, remove as much of the dough on inside as you can without putting a hole in the cup. This has to be done delicately. Then, with your fork, press the remaining dough to the bottom and sides of the cup. You want to be sure you have space to fill these. Put back in the oven for 3 more minutes for extra crispiness. Set aside and let cool. Take your berries out and stir. Set aside to cool to room temperature. Combine the cream cheese, almond extract, vanilla extract and confectioners sugar and beat until fluffy. Add 2 teaspoons of the white chocolate mixture and continue to beat. *Pipe the cream cheese mixture into your pastry cups and use a fork to press the mixture into the cup. Next, place a spoonful of berry compote on top. I added a small dot of cream cheese on top for decoration but that’s optional. *I put the cream cheese mixture into a baggie and snipped off one of the corners of the baggies and used this to pipe the mixture into the cup. The girls were coming over for tea and I was determined to make a fruit crumble. The problem was that I had one pear, one nectarine and one apple. Not enough of one fruit to fill a pie pan. I had made the crumble topping already so I got out my cupcake pan instead! Mix oats, brown sugar, and flour. Add butter and rub evenly in with fingertips until mixture is crumbly. Press the crumble topping into each tin to make a base. To this, I added a tad more butter into each tin and then baked it for 10 min at 350 degrees. You want this base to be nice and crispy. Dice the fruit and dust with cinnamon. Put a little of each into the cupcake pan. I kept the fruit separated, but could’ve combined the fruit. Then, I topped it with the crumble. I baked it for 30 min at 350 degrees. The topping didn’t look crisp enough so I put it in the broiler for a few minutes. The apple got drizzled with melted caramel, the pear was topped with toasted chopped pecans and the nectarine got a dollop of whipped cream. 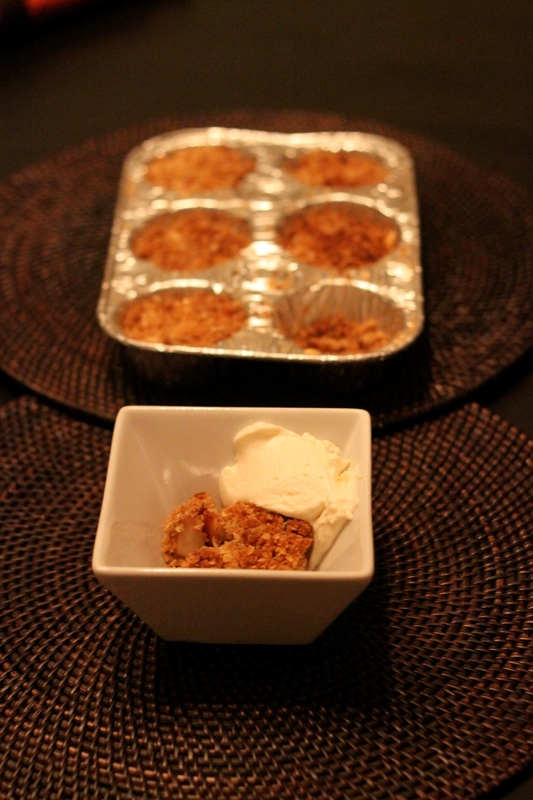 The ladies LOVED it and thought I spent a lot of time making individual crumbles, when it really took no time at all! My husband’s birthday is this week and I was making an early celebration dinner because his mom was in town. He is not a chocolate lover, so I was slaving away at a pecan pie for him. After I baked them I asked if he liked pecan pie and he said,”not particularly”. Can you tell we are newlyweds? I had no idea! 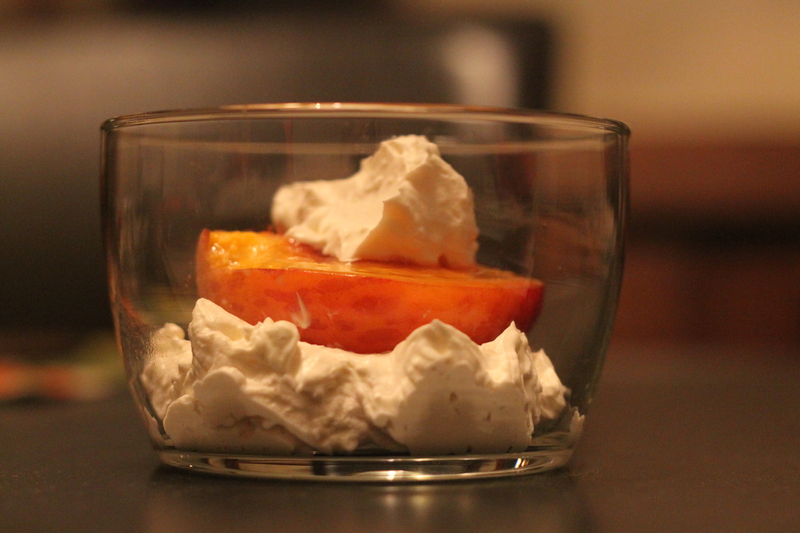 Instead of serving it on a plate with whipped cream or ice cream, I made a sundae out of it. 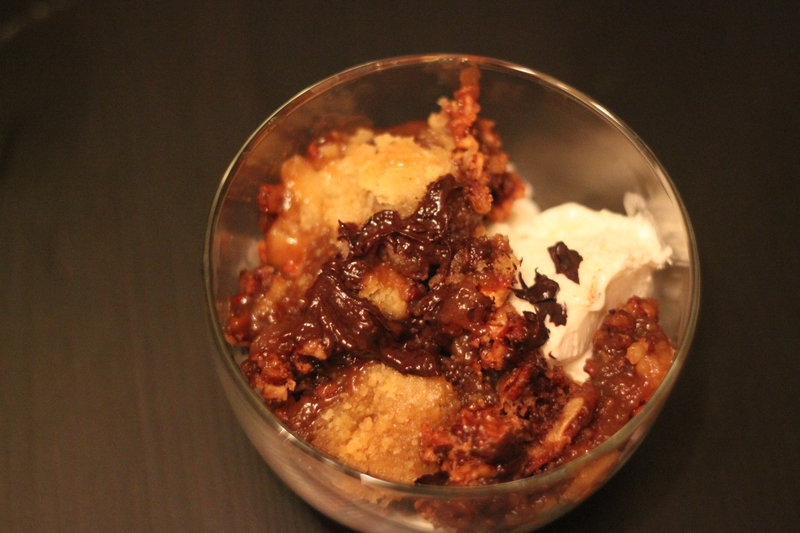 I put the pecan pie on top of vanilla ice cream and drizzled dark chocolate over it. It was a HUGE hit! He could not stop telling me how “amazing” it was. I bought a frozen ready-made pie crust which I don’t usually do, but it worked great! Whisk eggs and then your sugar and corn syrup. Add vanilla, salt, butter and bourbon to egg mixture. I whisk, but you can also beat together in mixer on slow speed. Pour into a 9 inch unbaked pie shell. Sprinkle evenly with pecan halves. Bake for 55 minutes. Pie should be firm and will “set-up” while cooling for at least 2 hours. It may crack. Scoop on top of ice cream with drizzled chocolate or serve traditionally. I recently had a dinner party with the intention of making a peach cobbler for dessert but completely ran out of time. I literally had no dessert when dinner was finished. I had grilled peaches in the past and decided to try broiling them. The result was so tasty and it only took 5 minutes! Slice the peaches in half and remove the pit. Put a pad of butter in each center and sprinkle the brown sugar over all 4 peaches. In a cold mixing bowl, pour in the heavy whipping cream and Mascarpone Cheese. Once it starts to thicken, add the powdered sugar and vanilla. Continue to whip until you see stiff peaks. If you beat too much, you will get butter, so be careful! 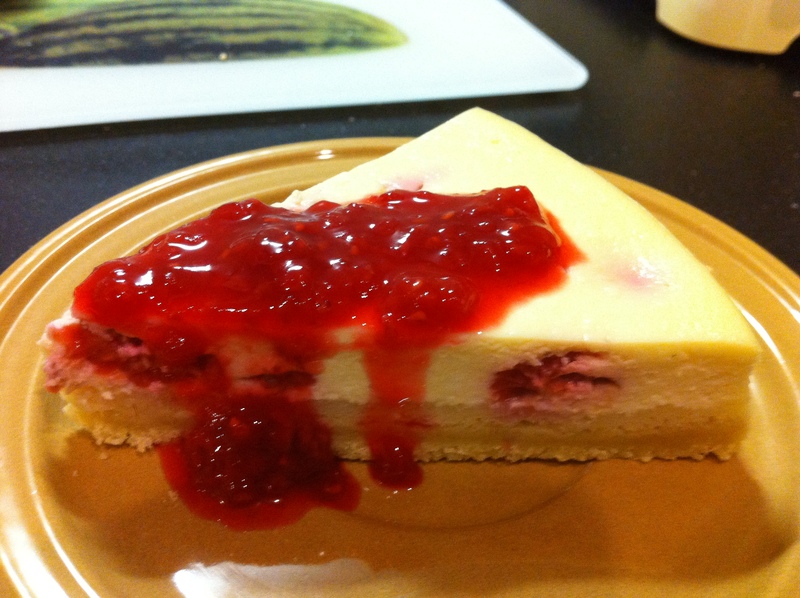 After seeing a simple but perfect cheesecake being made on Australia Masterchef, Alexis and I decided to give it a go. Now it’s not the cheapest cake to make but it is delicious and from time to time really worth making it. Mine was a little different to the Masterchef one, they used ground almonds in the base, I didn’t and I added rasberries to the mixture. As many raspberries as you fancy (I used about 2 handfuls and sliced in two). Pre-heat your oven to 150C. In a bowl add in all the ingredients for your base and knead them all together with your fingers, you know it’s ready when the mixture looks like breadcrumbs. Butter your cake tin and add the base mixture to the bottom of the tin. With a spoon flatten the mixture so it becomes hard and homogenous. Place in the oven for 15 minutes. Whilst your base is in the oven prepare your mixture. In a small bowl mix the cornflour and water and then add all the ingrdients together in a large bowl except for the raspberries. Whisk all ingredients together. Take your base out of the oven and pour in your mixture. Then add in your raspberries. Put your cheesecake in the oven for an hour, then turn the oven off and leave the cheesecake in the oven for an extra hour. It’s not over yet – you’ll need to leave it in the fridge for about 2 hours. Though I was in a rush so I put the cheeseake in the freezer for 30 minutes. Unclasp the cheesecake and either leave it on the tin base or move it onto a plate. I had some raspberries left so I made a quick coulis by adding a bit of sugar and the raspberries in a pan on a low heat until they melted together. A big apology for the abscence of blogs these past few weeks but I was on holiday in France enjoying the sun. It does however mean that I have come back with loads of new recipes. 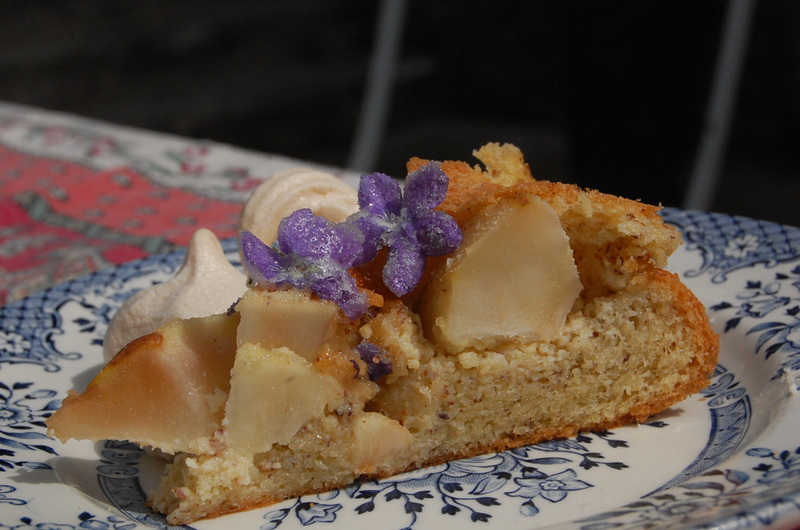 However today I’m going to share the apple cake Alexis and I just made – perfect for a rainy day in England – though the apples did come from my grandmother’s garden in France. Start with heating your oven to 180C. Peel your apples, remove pips and cut into small chunks. In a pan add apples, vanilla extract and about a tbl spoon of the sugar – mix together and cover on a medium heat. Every minute or so stir the apples and add a bit of water if you find they are caramelising. Turn the heat off when they go soft – should take about 5 minutes. In two bowls seperate your eggs. Mix the ingredients everytime you add a new ingredient – to your yolks add sugar, then your melted butter, flour and milk. Now turn to your egg whites and whisk until you can virtually tip the bowl upside down without them falling on your head 🙂 Now incorporate your whites to the other mixture. You don’t what to break your whites as their fluffiness is what will make your cake nice and light. So what you need to do is add the whites little by little to the mixture and fold the mixture over the whites. Once you have added all the egg whites add in the apples and then add to a non-stick or buttered cake tin. I LOVE my mom’s banana cream pie recipe but I wanted to do it a little different, so I changed the crust. Once I combined the first three ingredients, I pressed them into a pie crust pan. I covered it and put it in the refrigerator for 1-2 hours with a couple of heavy jars on top to ensure it would be as compact as possible. After two hours, I took it out and poured my melted caramel on top. You just want a thin layer because otherwise it will effect how your custard sets up. Put the crust back into the refrigerator for another 1-2 hours. When you are ready to start making your custard, slice the ripe bananas on top of your caramel layer. Sift the sugar, salt and cornstarch. In a *double boiler, combine the milk and cream over medium heat and slowly add your 3 dry ingredients. Stir until thickened and bubbly. Reduce heat and stir 2 minutes longer. Remove from heat and stir in 5 tablespoons (one tablespoon at a time) of the hot milk mixture into your beaten egg yolks. While you are slowly adding your tablespoons of the milk mixture, be sure to whisk constantly. This is the tricky part. If you do this part incorrectly, you will end up with scrambled eggs! Once you have added all 5 tablespoons, you can pour the egg mixture back into the double boiler with the remaining milk mixture. Whisking constantly, bring to a gentle boil. This should take 5 minutes (set your timer) then cook it for an additional 2 minutes. If you do not set your timer and you don’t cook it long enough, your custard will not set and you will end up with pudding instead of pie. Remove from heat and stir in your vanilla and butter. Pour custard into a bowl and press plastic wrap onto the surface of the custard. Cover and refrigerate for at least an hour. Then you pour the custard into your pie crust and enjoy! I know this sounds long and laborious but it really isn’t. Each step only takes 10 minutes. It’s perfect for those days when you are cleaning and doing laundry because you do one part and then go back to your chores. Then you do the next part and go back to your chores, etc. *I don’t have a proper double boiler, I just use 2 saucepans. The smaller one goes on the bottom.You get the water to boil on the bottom pan and you put your ingedients in a slightly bigger saucepan, which sits non top of the smaller pan. This ensures that you will not burn the milk. It is so easy to do. Two bananas have slowly been turning blacker and blacker on the top of my fridge. Now my flatmates are always happy when they see this happen as they know exactly what it means, it’s banana cake time! My friend Claudia is the person who originally gave me her banana cake recipe but it’s different every time I make it now. I’ve realised it doesn’t really matter how much of anything you put in it as long as you have walnuts, cinnamon and honey. This is a really healthy cake and is perfect for breakfast or an afternoon snack. I’m going to guess the weight of the ingredients I used, but please feel free to change them. Pre-heat your oven to 180C. In a large bowl add the bananas and mush up with a fork and add in all the ingredients, there really is no order. You just need to make sure that you mix in the baking soda with the flour. Mix everything together with a spoon. I usually use my bread tin but I couldn’t find it last night, instead I used a small ceramic oven dish and it rose more than it usually does, I’m definitely going to use that again. Butter your dish and slightly powder it with flour, add you batter and leave in the oven for about 20 – 30 minutes depending how moist you want your cake. Have fun and let me know how yours goes. I made a clafoutis the other evening with some of the cherries I brought back from France. It’s a very simple dessert to make and is pretty healthy as there’s no sugar or butter. Place the cherries at the bottom of a buttered baking dish. As there’s no sugar in this dessert the more cherries the better in my opinion. Pre-heat the oven to 180C. In a large bowl whisk the flour, milk, eggs and baking powder. Pour the mixture over the cherries and place the dish in the oven for about 45mins or until golden. My French grandmother always replaces the milk with some red wine to make a migourin, a speciality from the Loire region in France. Now get cooking, it’s cherry season! I have been making this for breakfast for so long that I forget that most people do not eat yogurt in this way. I kept adding more ingredients over the years so I realize that this may be a bit much for other people to enjoy. However, I decided to share this with everyone because whenever I eat it, I stay full for about 4 hours. This is unheard of for me because I have always eaten every 2-3 hours. Anyone who is friends with me knows this is true because I carry food with me at all times and when I don’t they all remember the monster I turn into when I am hungry and have nothing to eat! This recipe has helped me refuel after breastfeeding as well. Because it is high in Protein, Folate, Acidophilus, Potassium and Calcium, I also want to mention that this can be eaten for lunch as well when you are short on time. Just combine all of the ingredients in a bowl and enjoy!